Scientists agree: “Global warming” is not a global crisis. That all taxes, regulations, and other interventions intended to reduce emissions of CO2 be abandoned forthwith.” Agreed at New York, 4 March 2008. 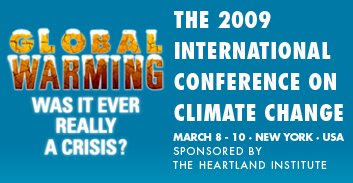 Don’t miss this years conference, to be held on March 8-10, 2009 in New York featuring more than 70 of the world’s elite scientists specializing in climate issues. Information HERE.